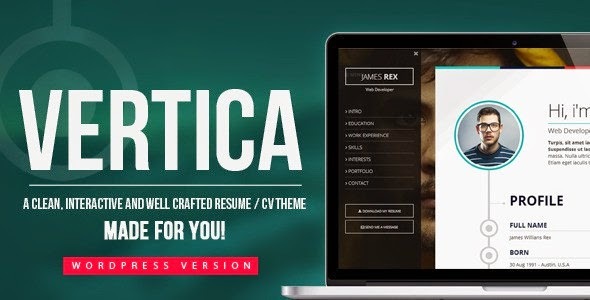 Vertica is a clean, multipurpose and well crafted cv / resume / vCard WP theme. It’s best for digital professionals, whether designers, programmers or photographers. It is perfect to promote your work! It features an interactive timeline, improving the user experience. Vertica is 100% responsive, retina ready and is built on Bootstrap Framework, with easy customization. It Also have Smooth Scroll, improving the user experience on all devices. Item Reviewed: Clean and Well Crafted CV Resume vCard Template 2015 9 out of 10 based on 10 ratings. 9 user reviews.